CASE STUDY – Do Coatings Protect Roofs? In May of 2013, a hailstorm rolled through Amarillo, Texas. The strong storm littered the streets with tree limbs and leaves. Zenith Roofing has many customers in Amarillo and was called out to inspect for hail damage. Zenith provides inspections for hail damage after storms, general inspections for condition and real estate sales. These inspections come with a full report and photos specifically detailing issues needed to repair. Our inspectors have many years of experience and knowledge of all roof systems. The roofs for this study involved three strip shopping centrs. One center included 1,800 squares of modified bitumen roofs of which 80% had an elastomeric coating applied over the modified bitumen. The coating was applied for granule loss and reflectivity. The coating was not installed as a warrantied roof system. The coating was thin in places but overall had good coverage. It appeared the coating was sprayed in some areas and rolled in others. The adjacent strip shopping center consisted of three buildings. All three buildings had the coating over modified bitumen. The coating on these buildings was also applied for granule loss and reflectivity. The coatings were not installed as a warrantied roof system. The coating was thick overall and had good coverage at details and parapet walls. It appeared the coating was rolled on these roofs, also. The third site a few miles away consisted of modified bitumen roofs without elastomeric coating. The condition of the roofs suggested these roofs were not experiencing granule loss and didn’t need the coating for that purpose. Two days after the storm, Zenith Roofing had staff on site to perform inspections for various properties. The three sites were the first inspections performed. Since the storm didn’t hit all of Amarillo, the purpose of the inspection was to verify damage before the owner filed a claim. Upon arrival, all three sites were directly in the path of the hail storm. Trees at all sites were shredded of their leaves. Signs and canopies had holes and other items were damaged. Before even getting on the roof, it was clear the buildings were impacted by the hail damage. The roof inspections began on the coated roofs. There were signs of hail damage on the metal vents and metal coping. The coated roofs showed no signs of damage but had clear oxidation throughout the roofs. Oxidation can be seen as a discoloration on the surface. Oxidation commonly occurs to fences and paint during a hailstorm. Due to there being no breaks or cracks in the coating, it appeared the coating protected the roof system. The inspection continued to the section of modified bitumen that did not have a coating. The modified bitumen suffered damage that could be identified from several feet away. Every area had multiple hits and there was no question the modified bitumen roof would need to be replaced. These conditions were typical across all three locations with coating and modified bitumen. The coated roofs only had oxidation and the modified bitumen roofs were heavily damaged. The inspector called the building owner and suggested filing a claim. The insurance responded quickly and sent multiple people out to inspect the roofs for damage. Naturally, the modified bitumen roofs were easily agreed as totalled. The coated roofs became a disagreement. The insurance representative argued that the coating is rubbery and protected the roof from damage. In effect, the hail just bounced off. Zenith Roofing argued that the coating was not thick enough to provide protection for the modified bitumen beneath. The coating was only hiding the damage. If applied thick enough, a coating may become a rubbery surface allowing hail to bounce. In this case, the coating was applied thinly in most places and had an inconsistent thickness overall, suggesting while it may have protected the roof in some places, the overall protection was minimal. The disagreement continued with the initial offer from the insurance company where they proposed a recoating of the roofs with coating and replacement of the uncoated modified bitumen roofs. 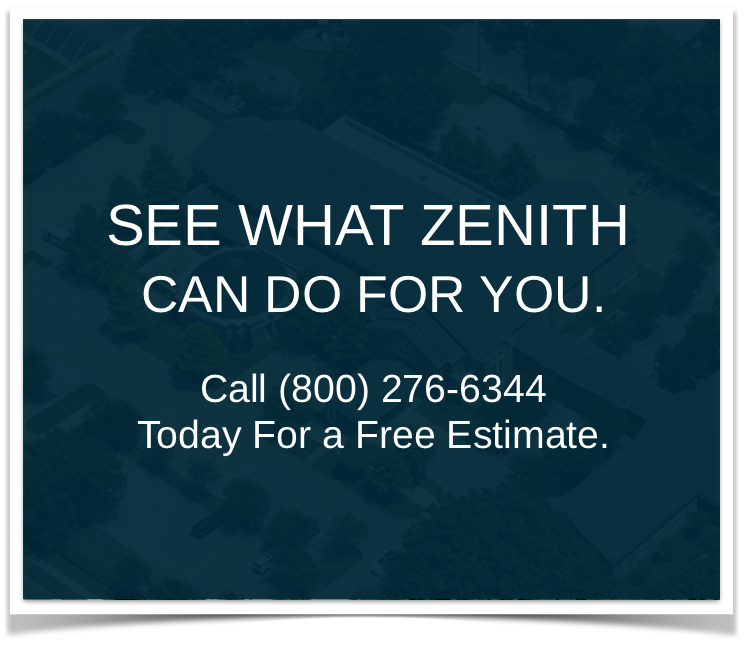 Zenith Roofing responded with a proposal for total replacement of all roofs. There was a significant difference in dollar value. To be clear, at no time did Zenith Roofing or the owner believes the insurance company was trying to short the claim. The visible evidence was in the insurance company’s favor as no breaks occurred in the coating. A second inspection was set up a month later and the insurance company brought a roof consultant engineer to take core samples to a lab for testing. Upon entering the roofs a little over a month after the storm, something very crucial had changed. The coating had broken in classic hail damage form. A month of summer Amarillo sun and heat had allowed the damaged modified bitumen beneath the coating to crack the coating. Hail damage was visible everywhere on all coated roofs. During the first inspection, Zenith was marking areas that were heavily oxidized with paint suggesting those spots were damaged. Now the circles were around clearly cracked coating as though it was predicted. All roofs were then replaced. The evidence suggests that hail may not damage elastomeric coatings initially, but can still damage the surface beneath the coatings. As with most commercial roof systems, a post hail storm inspection must go beyond a simple visual inspection of the surface. Knowledgeable and experienced professionals must make the initial inspection and determine a course for analyzing the roof system for damage. Cores must be taken and sent to a lab for testing if necessary. If you suspect hail damage, please call Zenith for an inspection.